Jukka Hauru is a forgotten figure in Finnish 70s rock, an artist long lost in the waves of Wigwam, Piirpauke and Pekka Pohjola albums that generally get the lion's share of attention. One of Hauru's albums was even released on the stalwart label of Finland, Love records. It's time to set the record straight. Hauru's debut, Information, was his prize moment. It's a guitar fan's paradise, a psychedelic rock album with some slight jazzy touches that includes wave after wave of Hendrix inspired soloing. 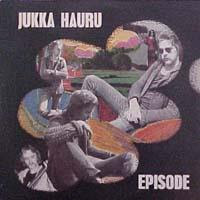 Hauru is just absolutely brilliant, sort of the long lost brother of guitar sensation Jukka Tolonen. Riffing drums and bass set down tremendously dexterous performances over which Hauru wails like a madman, pushing the songs, from short to long, to tremendous heights. 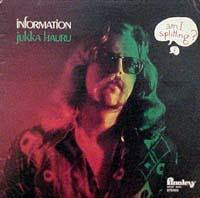 There is also a sense of humor prevalent on the album, as if Hauru didn't take himself so seriously - read titles like "Jam Session The Finnish Yes Federation's Skinheaded Board" and "Waltz for the Straight Relatives" (a piece heavily reminiscent of Flying Teapot-period Gong). But Information is not all about trio jams, although there are plenty here. Strings are brought in at times and there are also sax leads which help to break up the potential monotony of a guitar, bass and drums type of sound, interesting moments that add to the dynamic flow of the release, such as the piano piece on side 2. The way Hauru juxtaposes rather complicated ensemble sections with the free form, rocking jams works well to give the entirety a diverse flow. But in the end, it's Hauru's guitar show (as well as the less prevalent violin and sax solos), and he was just such a magnificent player, riffing at light speed over anything his backups throw at him. If you love good playing, this album is a no-brainer. Never was the intense riffing style of the earliest Mahavishnu so matched in energy. Episode was a completely different beast. 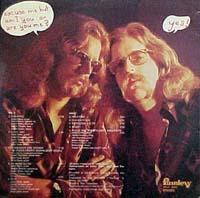 Eradicating any sense of the Hendrix inspired psychedelic nature of the first album, Hauru did what many early 70s artists did in the fusion era by slicking up his sound into a unit where complicated unison lines are practiced into sterility and virtuosity becomes prominent. Fortunately Hauru brought with him from Information his skill at balancing aggressive pieces with those more low key, although by now all focus is on fusion and jazz to the detriment of those zany, wild-flying pieces that made his debut such a joy. It's not to say the playing isn't any good, if anything it's certainly more mature, yet the restraint and lack of raw power takes the edge off in ways that adds to the loss of distinction. Information was a psych rock ensemble verging fusion, while Episode is after the arrival to the latter. There are still plenty of solo moments from guitar, sax and even an increase in the synthesizer/keyboard prominence, but the atmosphere here seems subdued. I suppose I'd have been more impressed had I heard this album first; it even has a smaller song line up. But overall, it's difficult to see this as anything but "yet another fusion album," particularly disappointing after such an amazing debut. Undoubtedly Hauru went onto other things, but left no other solo albums under his name after these two. Certainly Information is highly recommended and fans of fusion should probably check out Episode as well. Hauru was truly one of the better unknown guitar players from Europe. As reviewed for Gnosis2000.net by Mike McLatchey. Not much more to say,except that these are 2 of the most representative LPs of acid/psych fusion sound in Finnland in the early/mid 70s. sorry but i've to ask you where you can find this stuff?? ?great(as usual)!!! whitch are your online record store?? ?i don't find anything! Hello, a letter of congratulation for hisyour excellent blog and an enormous request, we are a group of experimental music of Mexico and are trying to do promotion to our material, here she is very difficult since the people are small to the one that interests this kind music and we decide to do it by means of Internet, we would be grateful they could publish the CD in your blog. You non-Finns might be interested to know that Hauru is now a music critic for Finland's biggest newspaper, Helsingin Sanomat! Thanks for posting these albums!!! I've been searching for them for a long time! As soon as they are available on CD, I will buy them. Any chance of posting the Esa Kotilainen album from the 70's?